The Curious Liberal: "There is an Alternative" But is there a Plan B? Shortly after the formation of the Coalition Government, PCS reps across the country worked with local Trade Councils and other unions to set up campaigning organisations such as Cambridgeshire Against The Cuts. 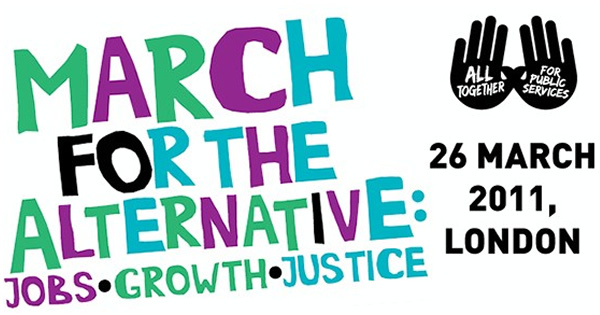 The aim is to campaign against cuts in vital services both locally and nationally such as supporting the Judicial Review into the stopping of bus subsidies locally and the March for the Alternative. Supporting this, the PCS produced a booklet. There is an Alternative. As far as I can tell, the only cuts they are in favour of, is that of Trident, government consultants and withdrawal from Afghanistan. But it makes the case that to reduce the deficit (but not necessarily the national debt) between revenues and spending is to close the loopholes leading to tax avoidance and evasion and a Robin Hood tax. Revenue raising rather than cutting spending. It seems the time has now come to test out these ideas for real. The most prominent elections over the weekend of the 4-6 May 2012, have not been the local elections in the UK, but in France and Greece. France elected their first socialist President since 1981, Francois Hollande, on a platform of raising corporation tax; raising tax on earnings over £1m euros; hire more teachers; raise minimum wage; and reducing pension ages along with renegotiating the Treaty on Fiscal Discipline. Greece on the other hand, facing even more stringent austerity measures threw out the New Democracy/Pasok coalition and now it appears Syrizia want to form a coalition on the basis of tearing up the bailout agreement. Will both succeed in their aims? The pressures of the market can ruin even the best laid plans especially when the rest of the eurozone and UK will be wanting their money back. Hollande's policies are not new, it did not work for Francois Mitterand in 1981 who had to make successive U-turns on his policies and in these times of fiscal discipline, it's nothing more than an experiment on a patient where the doctors do not know how to cure the disease, then after that, whats left for the Left in Europe? They have made the running with all the arguments not to cut, but at a time when the Left did not run an European country. Now they do. Lets see whats come of it, but if it goes wrong and Greece continues to be the sick man of Europe and France gets dragged down too, never mind George Osborne, do the PCS and their fellow Left groupings across Europe have a plan B?